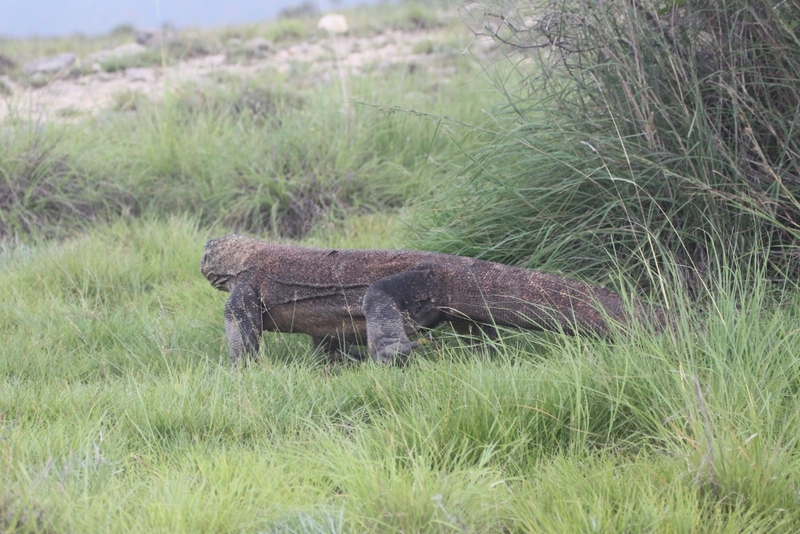 Last week we had the opportunity to explore Komodo National Park, a small chain of islands off of Flores Island in the East Nusa Tenggara region of Indonesia. 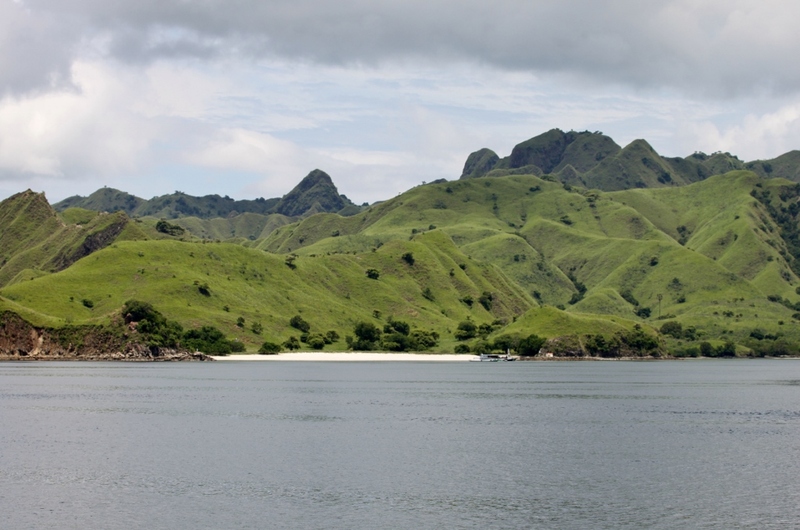 We set out from Labuan Bajo on Sophie and motored two hours to Komodo Island where we anchored in 60 feet of mud a few hundred yards from the park entrance. 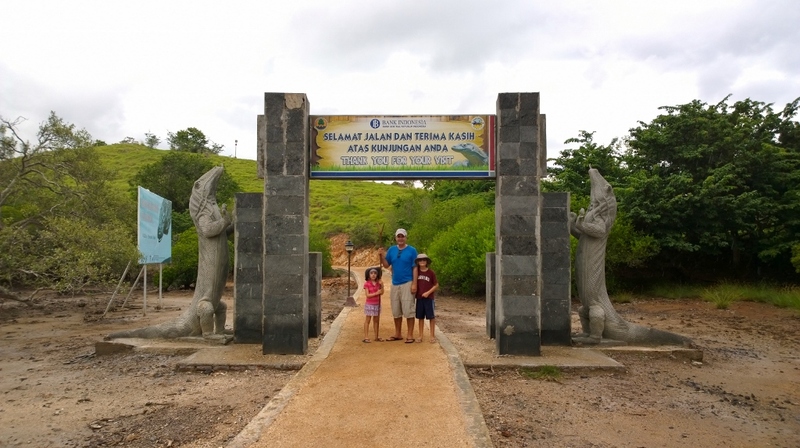 We had purchased park and snorkeling passes in Labuan Bajo, but on site at Komodo and Rinca, there is also a modest local tax and ranger fee for the guide who will accompany you and protect you in case of an attack. 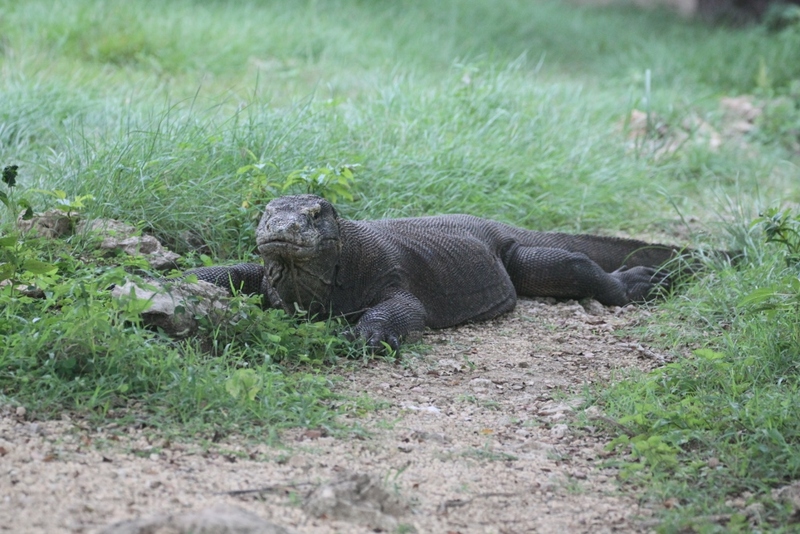 Our Komodo guide spoke excellent English and we were surprised to learn that dragons were just a couple hundred meters from the ranger station. I had envisioned a long mountain trek with the promise of catching only a glimpse of one or two if we were lucky, but they were all around the camp. My heart started pounding as we walked down the path. These dragons are big! We were all pretty scared as we approached the first one. It looked like it was sleeping, but our guide explained that was part of its “camouflage” and that it was alert, just waiting for prey to wander by (that includes us). He encouraged us to approach it from behind for some photos. 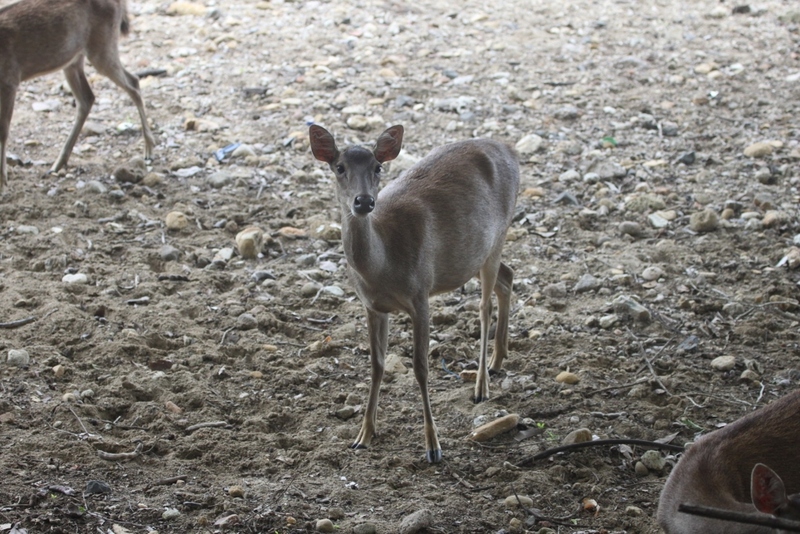 The kids were incredibly brave as we crept closer. 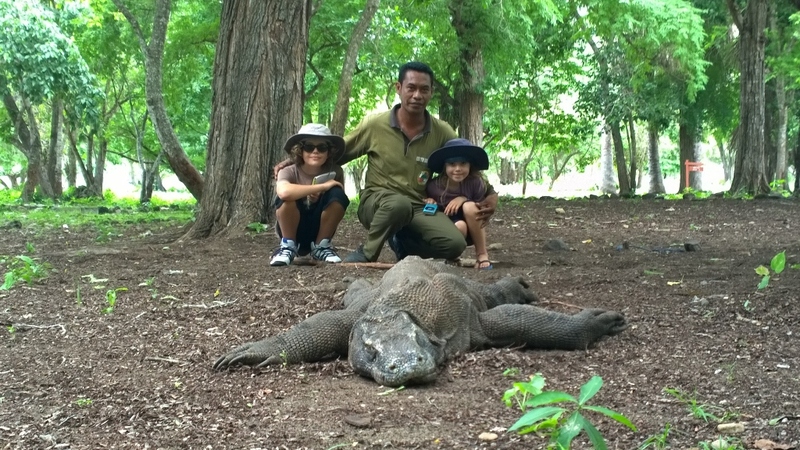 Note, our guide crawled a few feet closer when he took the photo of me than I did for this shot of him with the kids. After this first encounter, we continued along the camp path towards a bunch of dragons hanging out near the kitchen. 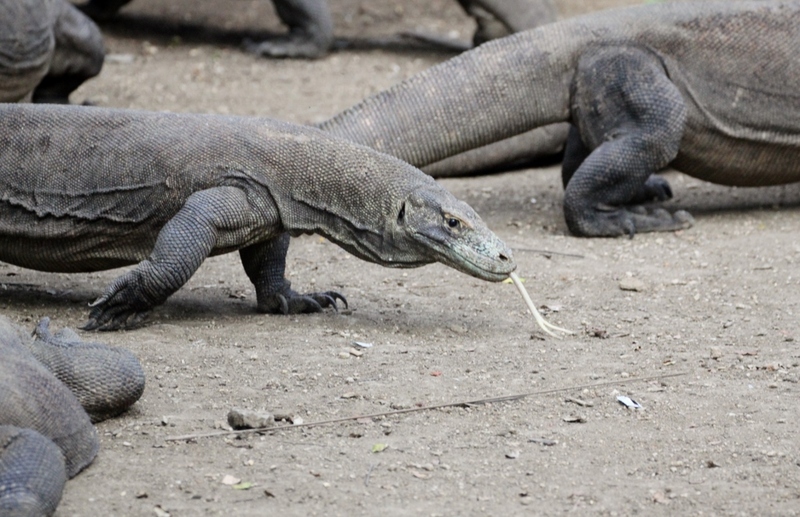 The guide says they don’t feed the dragons, but we suspect they taste some scraps. Jamie and our guide wielded forked walking sticks for protection in case one of them attacked. Luckily they never had to use them. 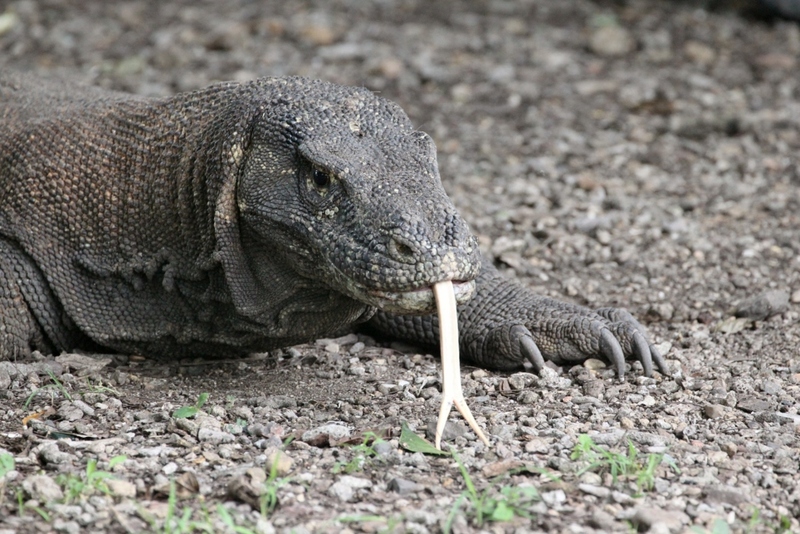 The dragon tongue is remarkable, like a long, flat, forked stick of chewing gum. At one point, this one stuck its tongue out repeatedly and then looked in our direction. 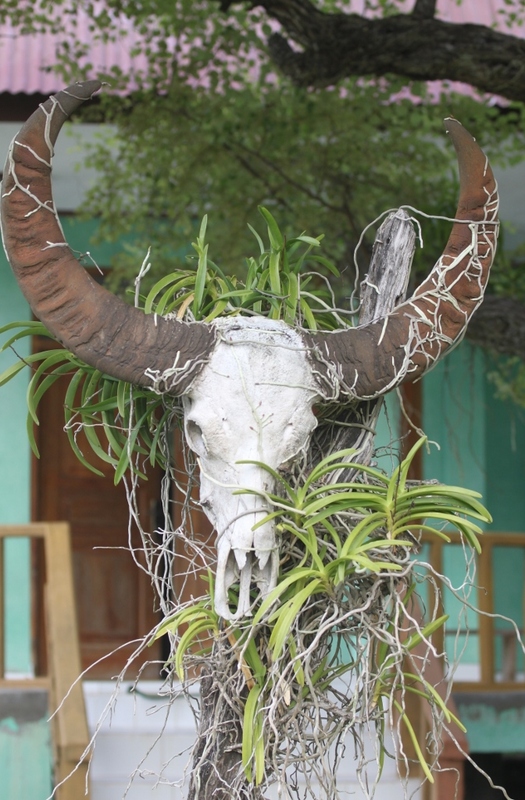 Our guide said it was a sign of aggression and moved us out in a hurry. The kids are studying food chains in Sophie School science right now, and we couldn’t have asked for a better hands on lab. 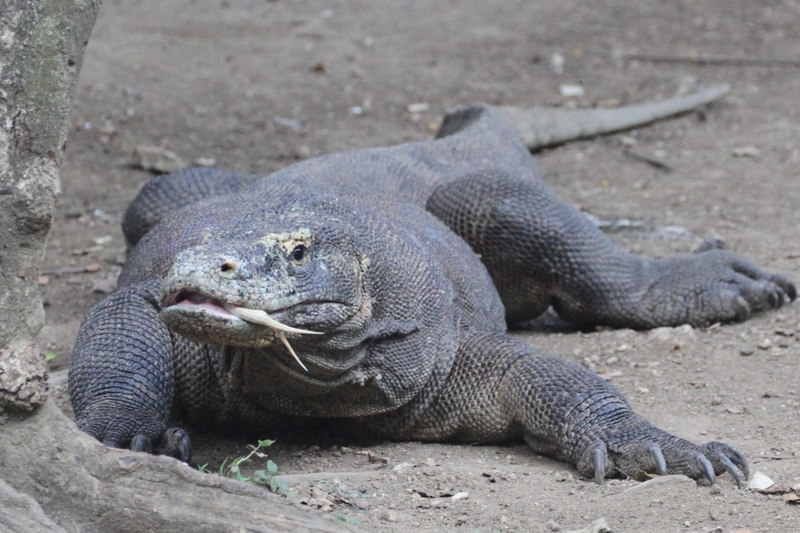 Dragons eat deer, pigs, monkeys, water buffalo, wild horses, other Komodo dragons, and of course they are known to bite people. The deer looked so innocent walking right by the dragons. 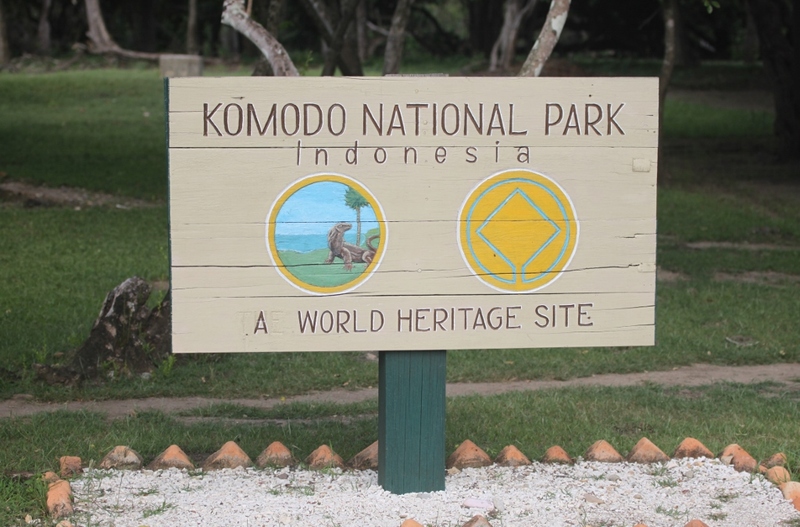 Komodo Island. This water buffalo wasn’t so lucky. 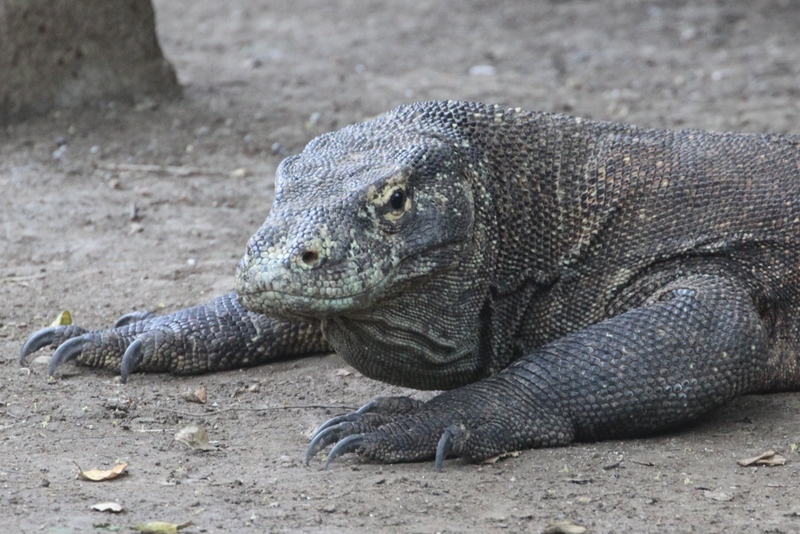 There are about 2,500 dragons on Komodo Island and another 2,400 on Rinca Island, which means they outnumber humans by about three to one. Dragons have been known to walk into houses and climb up through open windows, so people have to lock up as a precaution. On Rinca our guide explained that dragons have climbed up the side wall of the guest cabins and can make it through windows that begin seven feet above the ground. Despite all of this, neither guide has ever seen a dragon kill and eat its prey. Apparently they typically eat first thing in the morning, if at all. They just sit and wait for an animal to walk by and then attack. 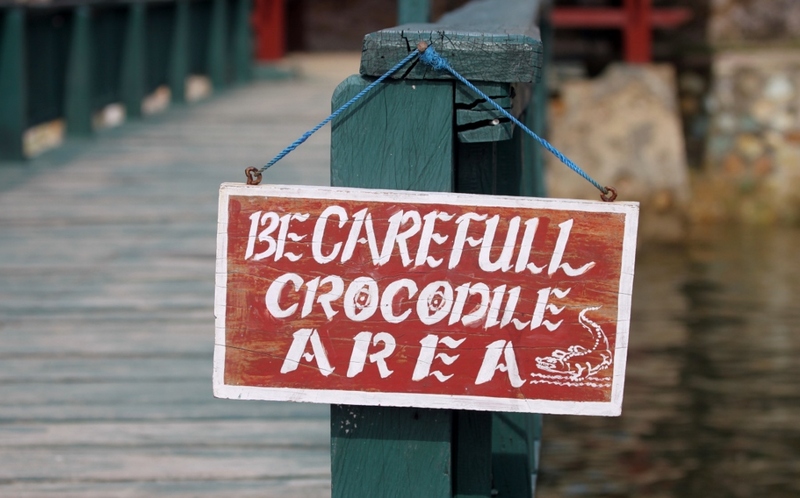 They aren’t venomous, but sport 60 types of bacteria in their mouths, one potentially lethal. 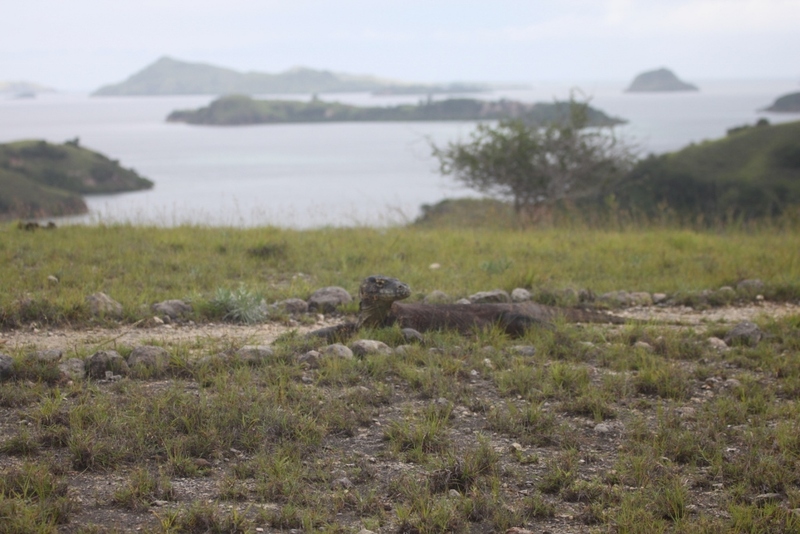 The Komodo Island group reminded us of the landscape in New Zealand. If it weren’t for the thousands of carnivorous dragons about, sheep would love the lush green hillsides. 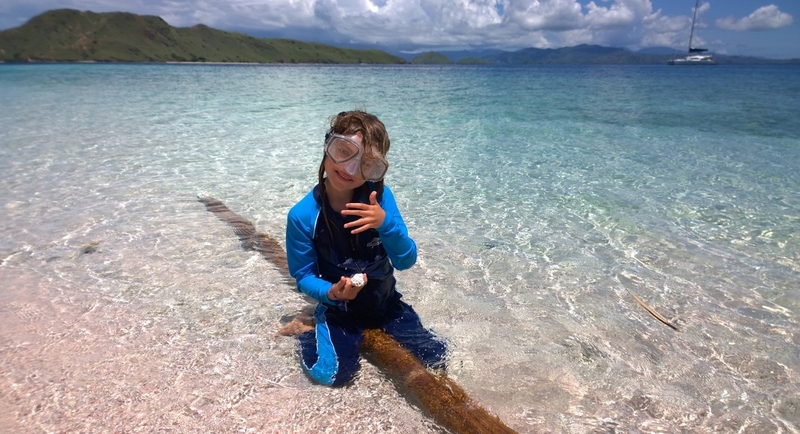 To celebrate Valentine’s Day, we started with a family snorkel at Pink Beach on Komodo Island. The reef at Pink Beach had some of the best fish we’ve seen anywhere in Indonesia, but I didn’t bring my underwater camera with me. Every once in a while it’s fun to just enjoy the experience. 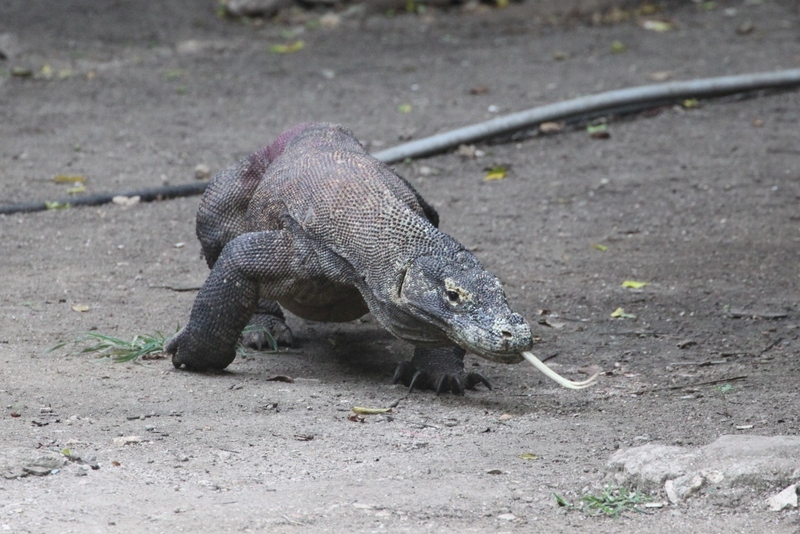 After lunch we motored over to Rinca Island, the other home of Komodo Dragons, and dropped a hook in 50 feet of mud near the park entrance. 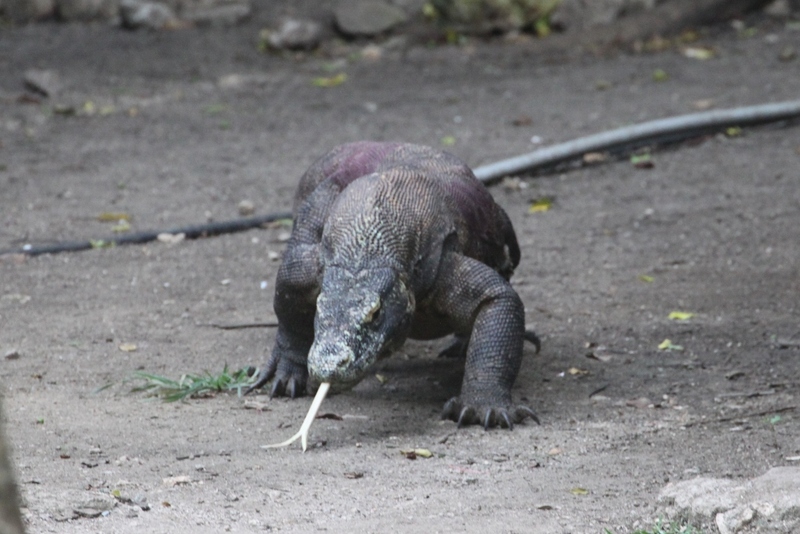 As if Komodo Dragons aren’t enough of a danger! 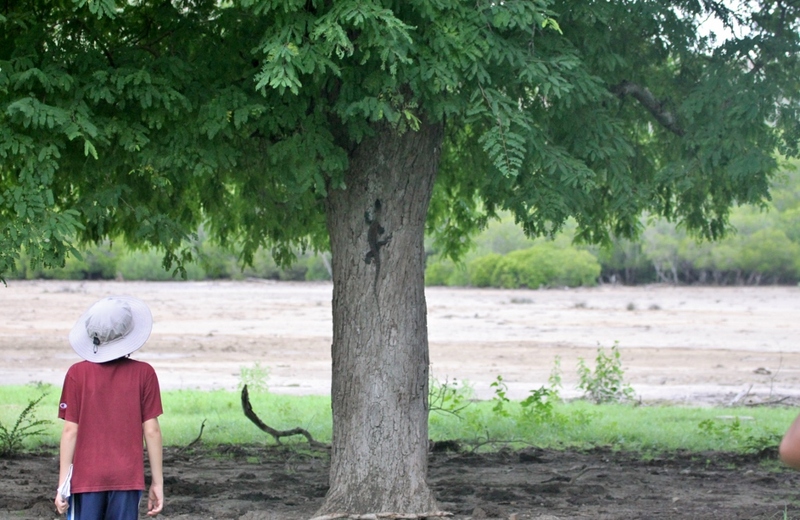 After we paid the head ranger, “Uncle,” and had a quick safety debrief with our guide, we set off on a short trek that promised the best chance for seeing a dragon. We were not disappointed. 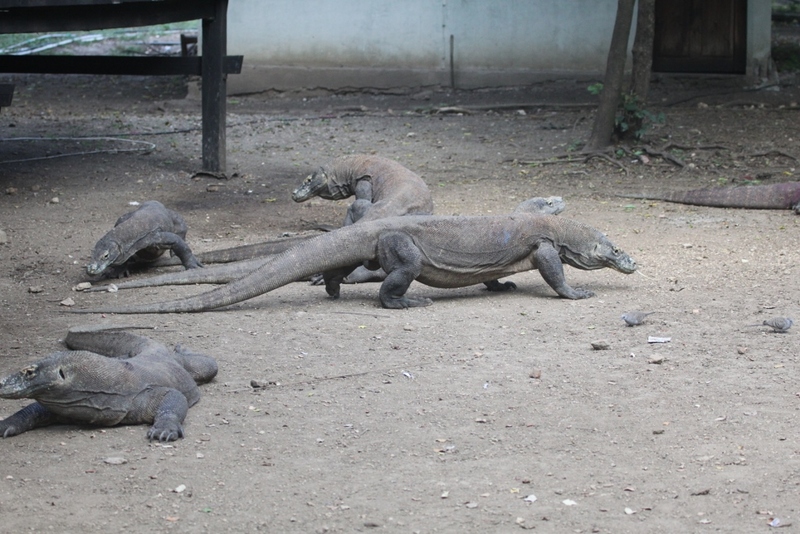 Like Komodo Island, a handful of dragons hang out near the camp kitchen. Although it’s not quite the same as bumping into one way out on a trail, we couldn’t help being impressed and fearful of the hungry dragons. We also learned that the rangers spray aggressive dragons with red paint so they can keep an extra close eye on their behavior. 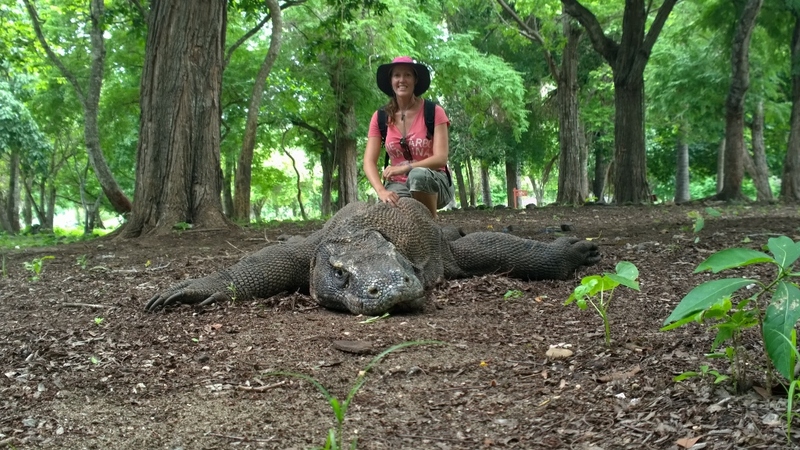 Our guide said they only do this after a dragon has tried to bite a human. We kept our distance from the big red painted one in the back of the group. 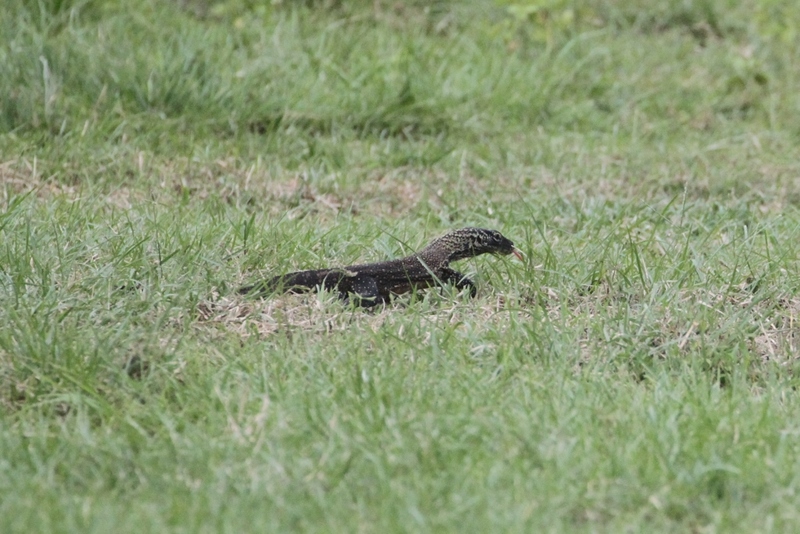 The aggressive one also looked the most sedate, better at waiting for prey to get close before making a move. If staring at you and sticking a tongue out is a sign of aggression, we saw plenty among the group by the kitchen. We carefully circled around them to start our hike up the hill. 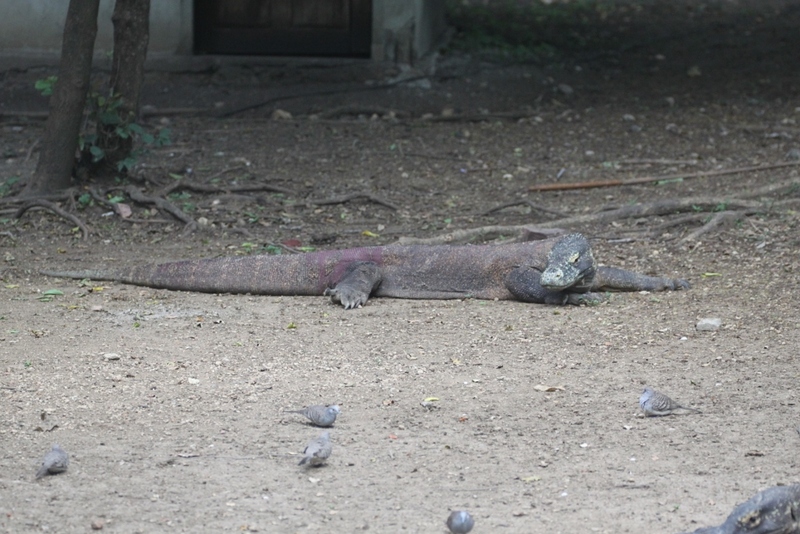 Our first stop was a dragon nest where the females lay eggs once a year, then wait for a couple months for the rainy season which brings a layer of mud to cover the eggs. Although this sounds like a protective parental instinct, it turns out the biggest danger to newly hatched dragons is the mother herself, who will eat any she catches. Up on the ridge, we stopped to take in the view and catch our breath. 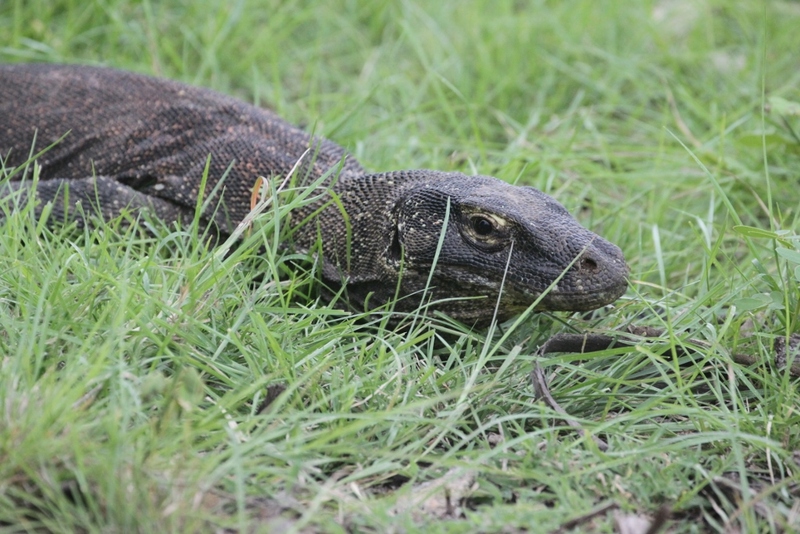 All of a sudden, we spied a dragon in the bushes near the trail. I thought it was a small one at first, but as it moved realized it was as large as the other adults we had seen in the camp. 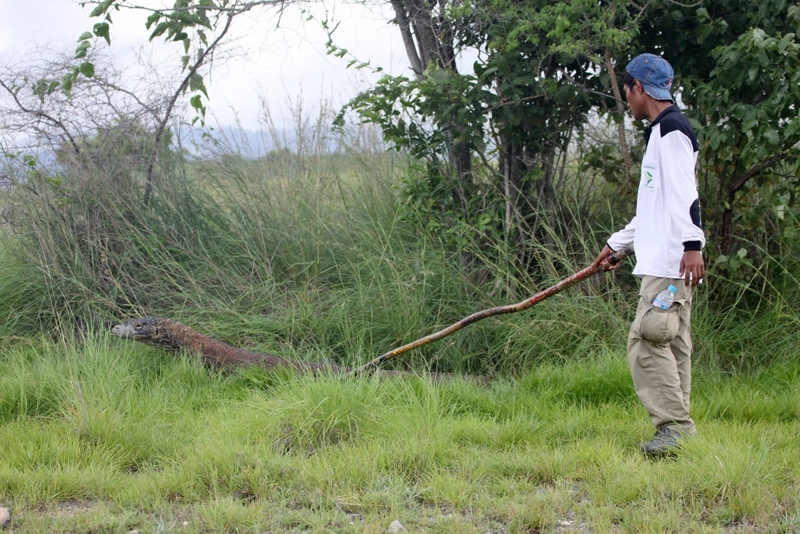 Our guide kept his stick handy to make sure it didn’t come any closer to us, and we were quite relieved when it turned up the path instead of heading straight towards us. It’s surreal to be out in the wild with these creatures. I figured our dragon sighting was finished at this point, but as we climbed the trail back down to the camp we spotted another dragon directly in our path. We passed the kitchen on our way back and watched some commotion as something small fell out a window. Our Rinca guide was more forthcoming about the lax scrap feeding policy by the kitchen. 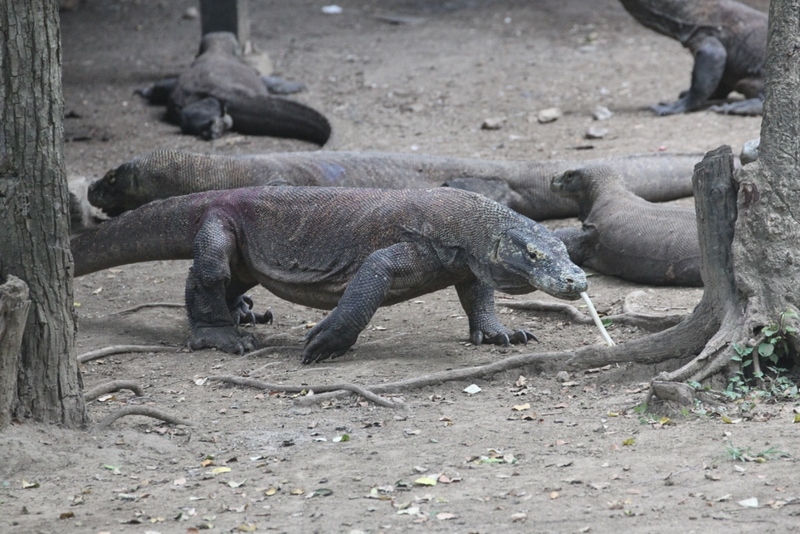 As we headed back to the boat, we came across a few more dragons. 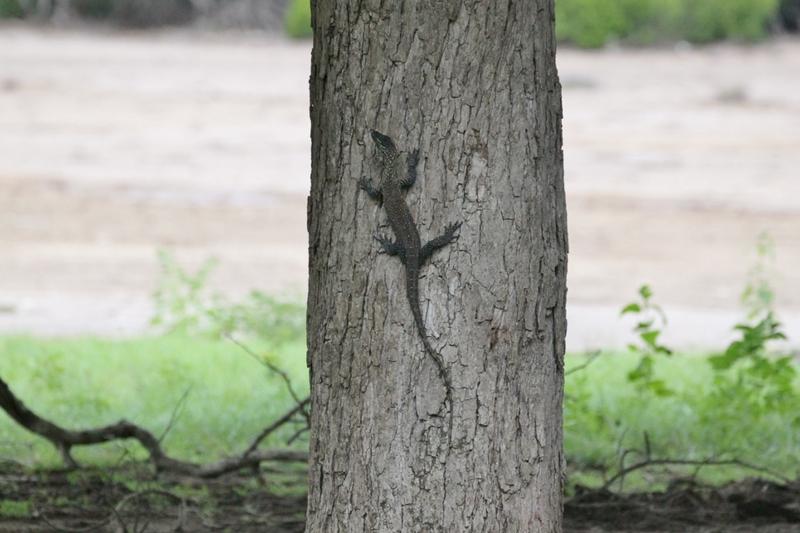 The first was a baby komodo dragon that scurried up a tree as soon as we got close. It was quite a relief to see a dragon that couldn’t and wouldn’t try to kill us after all the fully grown ones. 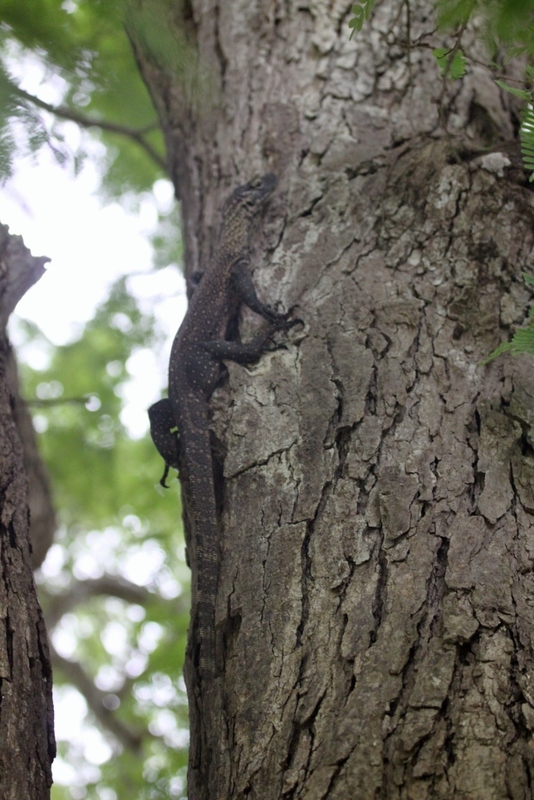 Baby dragons live for up to three years in trees to keep away from adult dragons. 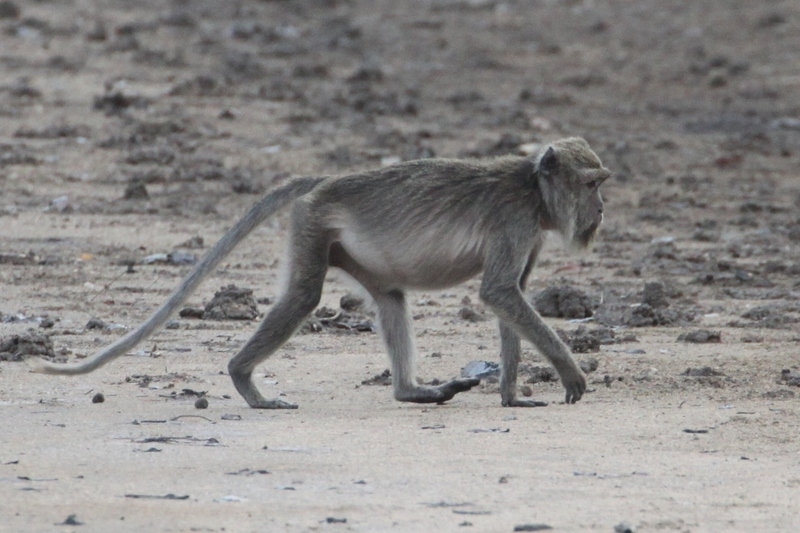 We also spotted a young adult who our guide said was too small to attack us. 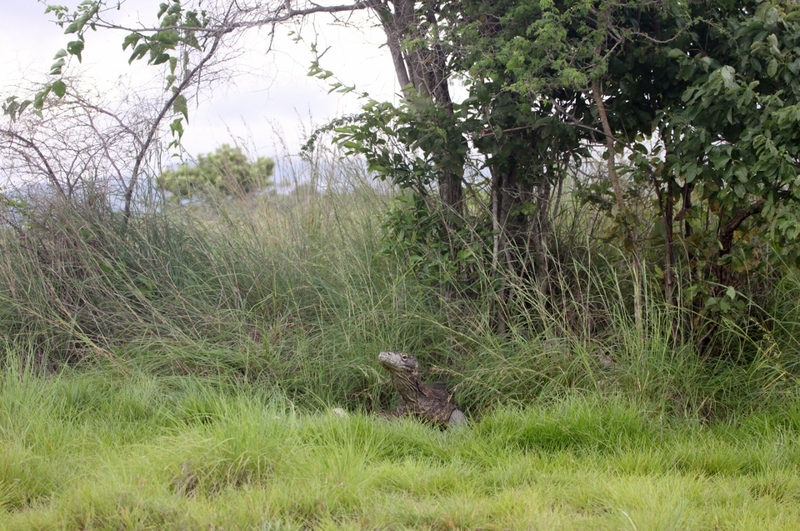 We didn’t get too close, but were a lot more relaxed around this guy than the previous encounters. The kids had fun sketching the dragons and taking notes for school. 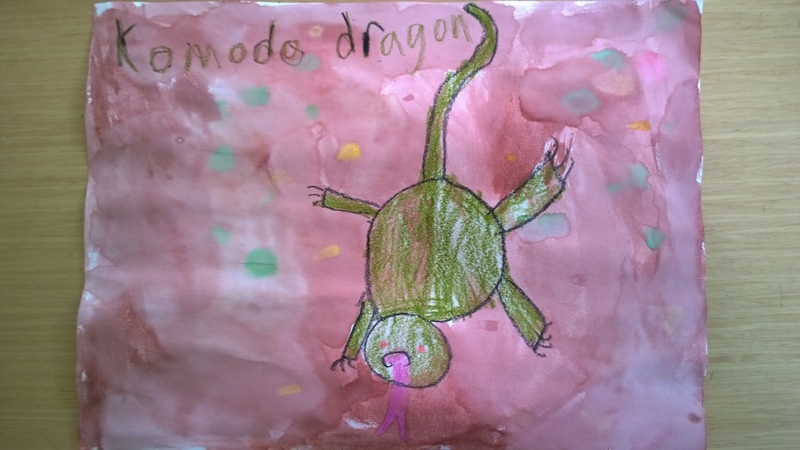 They are both writing reports on Komodo dragons and Hazel made this painting. 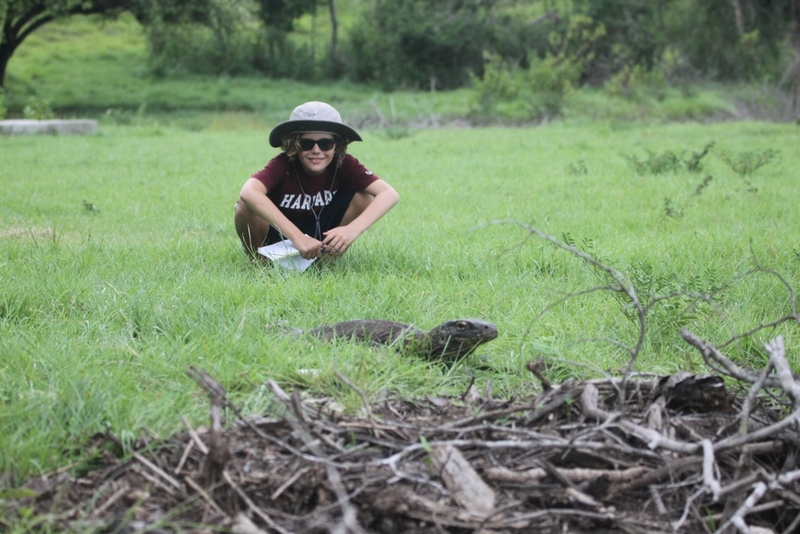 Feeling completely satisfied with our Komodo dragon adventure, we said farewell to our guide and the park. After two days of dragons, we were all ready for some quality beach time. 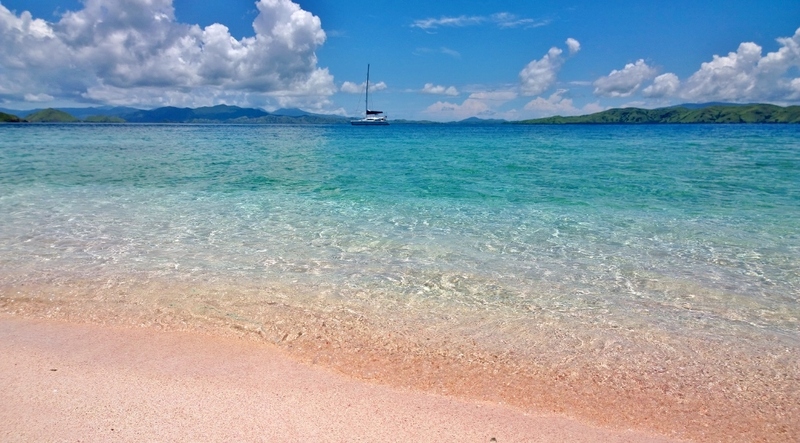 We stopped at a little uninhabited island halfway between Labuan Bajo and Komodo fringed by soft pink sand and turquoise water. We couldn’t have picked a more perfect day. 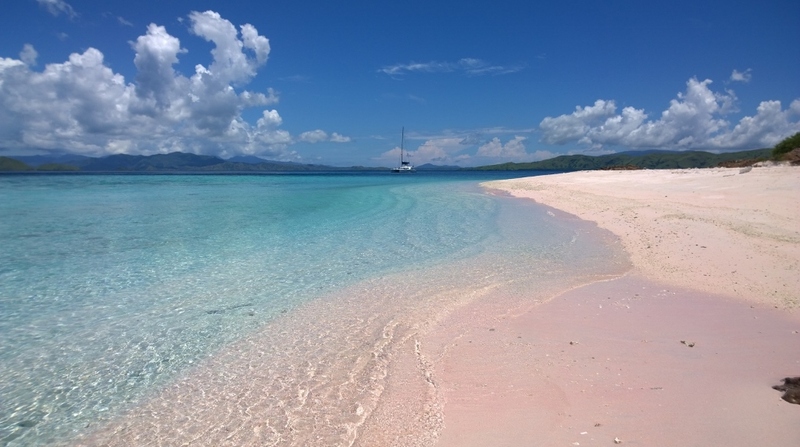 A handful of sand revealed countless red flecks of coral, the pinkest sand we have ever seen. 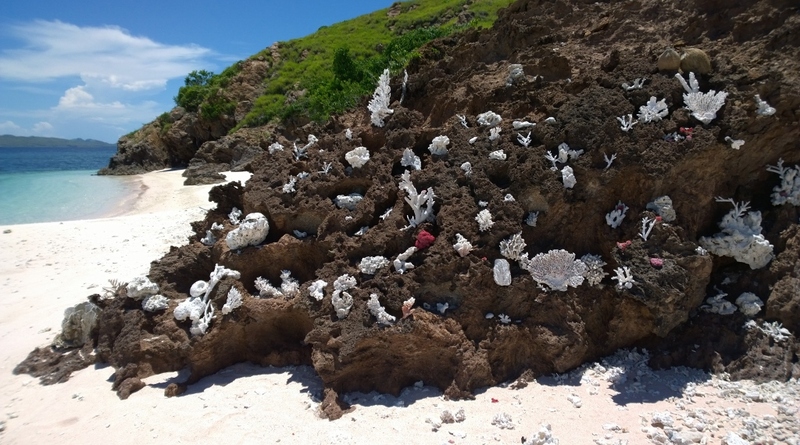 We came across a wall of coral art and contributed a few more pieces to the collection. The kids played on shore while Jamie and I snorkeled. 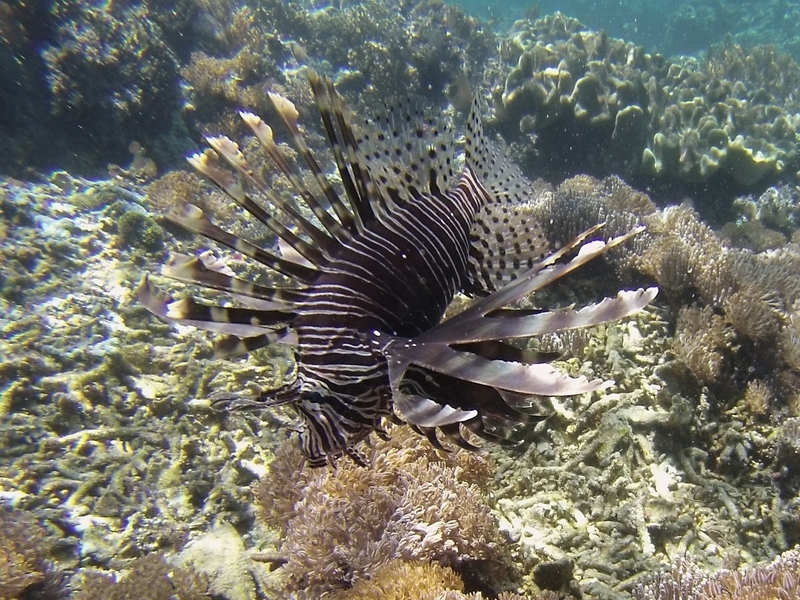 We have been so fortunate to experience the abundance and variety of sea life in Indonesia. Our underwater highlight here was a group of lionfish. For our last night, we anchored at Labuan Bajo and enjoyed a relaxed dinner at the Mediterraneo Restaurant, sharing fondue, crème brulee, tiramisu and chocolate carpaccio for dessert. Have I mentioned lately how lucky we are? I just heard from Jenna in Bali. Hazel saw a doctor last night. All of her tests came back negative. She’s fine and will enjoy a day relaxing by a hotel pool with her mother and second cousin. It’ll leave it to Jenna to post some photos. Last night during my shift I watched the movie “Titanic.” At one point in the film, the captain wrote down the coordinates for the location in the North Atlantic where the Titanic hit an iceberg. 41.46 N, 50.14 West. I entered that as a new waypoint into our chart plotter and saw that it is on a latitude south of Boston. It is also just 8700 miles from Sophie’s current position. Since we have already covered over 1200 miles since we arrived in Indonesia in November, the spot of Titanic’s sinking doesn’t seem that far away to me right now. We are currently thinking about crossing the North Atlantic in the summer of 2017. It would be really sad if we hit an iceberg. But that is a worry for another day. 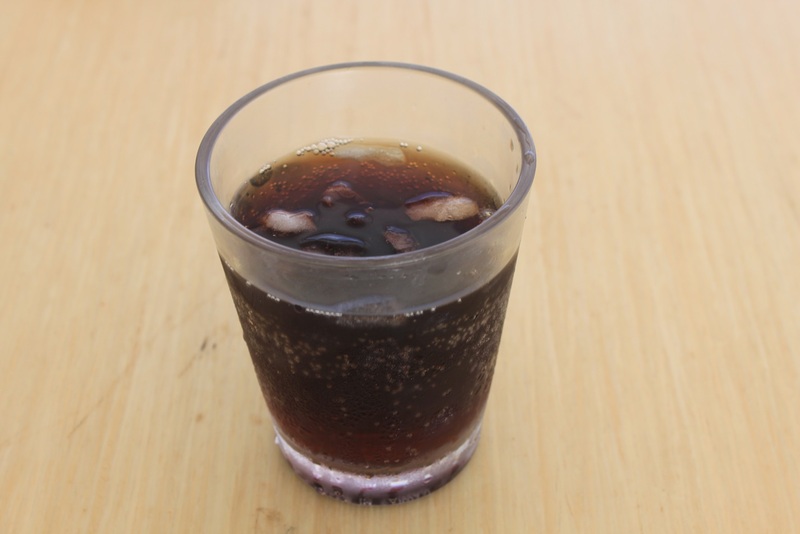 The only ice we like to think about these days is the ice that goes into our passage enders, like the run and coke I enjoyed after we dropped an anchor at noon today in the Riung island group on the north coast of Flores, 250 miles and 50 hours from our starting point in Hoga. We had no squalls over the last 24 hours, and the wind died out at sunset. We motored throughout the night directly towards our destination in order to give Holly a day of beach time. 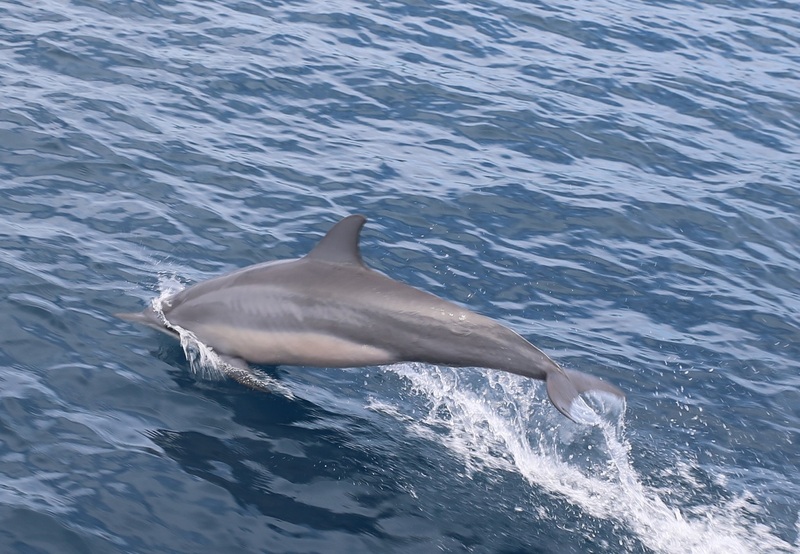 We wound up running both engines and cruised along at 7 knots through a glassy sea. 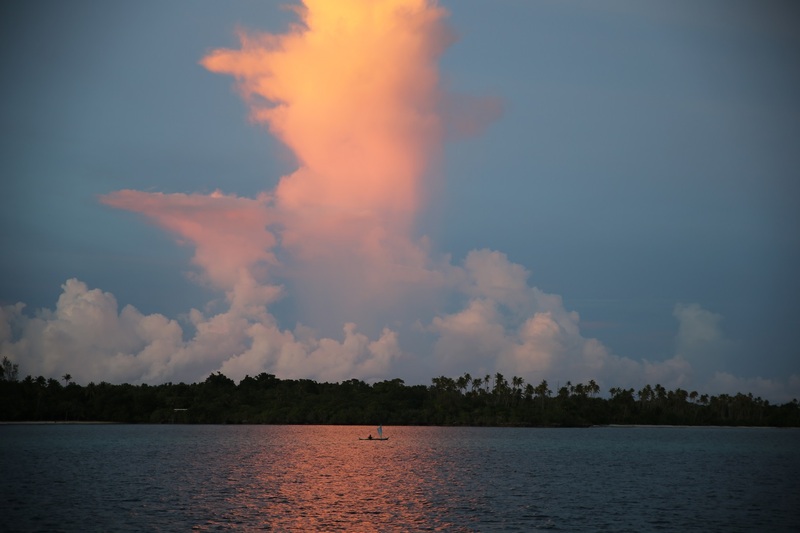 Flores greeted us this morning with a rosy sunrise and a string of active volcanoes. It was pretty cool. I did the 2:30 AM – noon shift to give everyone else the opportunity to sleep in and then have a productive morning of Sophie school. Our morning was interrupted by a fish ball encounter. We saw some birds working a disturbance in the water, and as we got closer we saw a school of large tuna arcing into the air. Some of these were big fish, and they were jumping high. We already had a tuna lure and a Rapalo in the water, and I quickly added another big marlin squid which doubles as a teaser. We drove through the school multiple times, all with no luck. We soon learned why. In the middle of the action was a line of dolphins lined up like armored knights on horseback in a Peter Jackson film, marauding through the tuna like they were a band of overmatched Orcs. Here are two of them, all business. The odds of those tuna hitting our lures were equivalent to the odds of my stopping for a pastrami sandwich while being chased down an alley by an armed gang. Or a line of armored knights on horseback. It just wasn’t going to happen. The action did get everyone out of the cabin and into the sunshine. Holly and Jenna got some good photos. Everyone had fun. 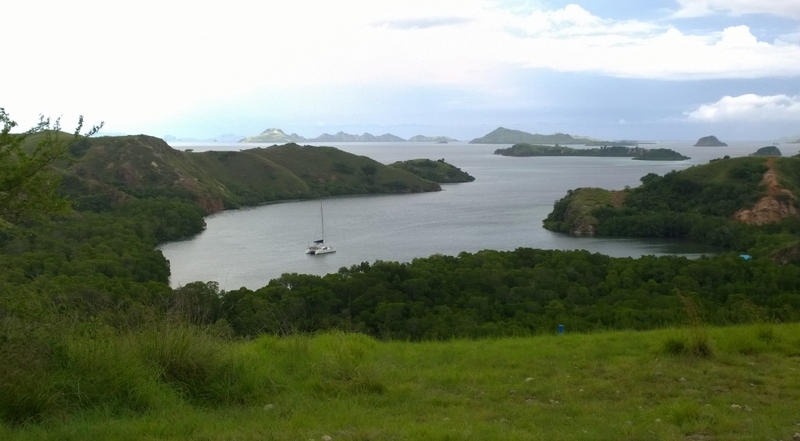 Our anchorage in Riung is spectacular. We are nestled up against a small island surrounded with beaches, one of which Leo named “Sand Dollar Beach.” The rest of the crew paddleboarded in and explored the island while I enjoyed a post-shift nap. 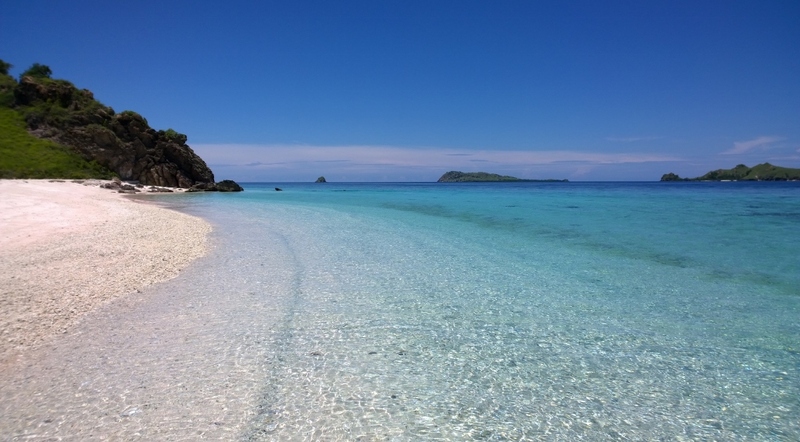 We will spend two days here enjoying the serenity of Sand Dollar Beach and then motor the 80 miles overnight to the port of Labuan Bajo, where Holly will catch her flight back to the US. There is no wind forecast for the next few days, and I am pretty certain we won’t have to worry about icebergs. We have been pretty lucky in that department so far. Sophie left Hoga yesterday to continue on our passage from Ambon to Labuan Bajo on the western tip of Flores Island in Indonesia. We have a 10-12 knot westerly wind plus a slight current against us in the Flores Sea and covered 130 miles over our first 24 hours. It has been a relatively gentle passage so far. Holly and the kiddies took some Dramamine before we left, and no one has gotten seasick. Our current position is 07.05.210S, 122.39.873E. We are heading due south at 5 knots. The wind is forecast to die down as we approach Flores, and when it does so we’ll hang a right and travel along the coast. 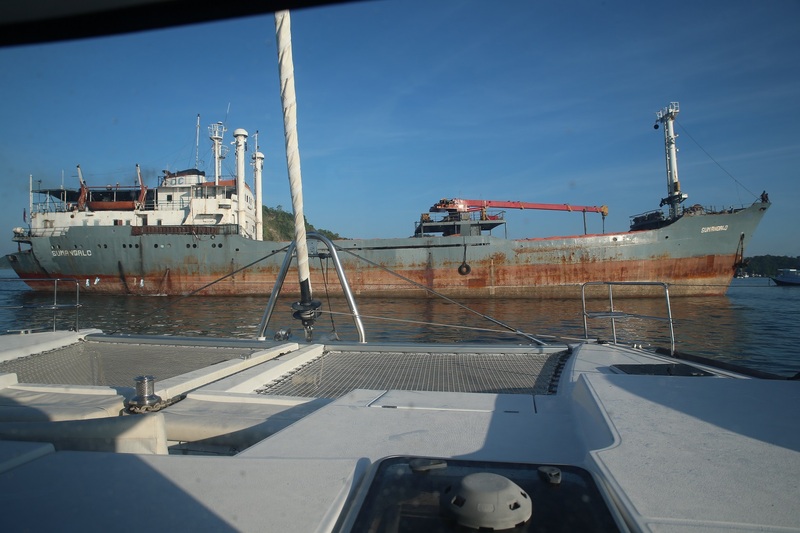 We left Hoga by heading around the top of Kepulauan Island and then sailing 14 miles southwest towards an unmarked pass in the Pulau-Pulau reef. Well, it turns out the Indonesian government has erected an enormous navigation marker on the southern end of the pass, right next to six fishing huts mounted on stilts over the reef. 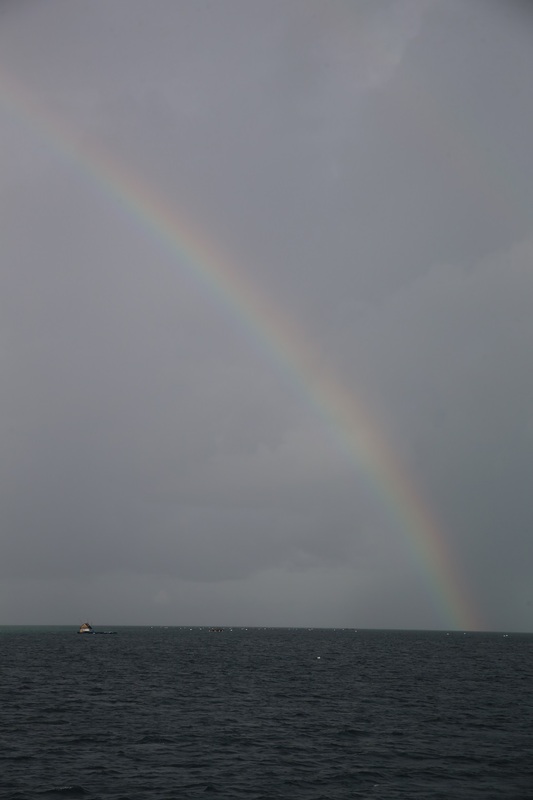 While there we were treated to dancing dolphins and then turned around to see a massive squall, complete with a waterspout, attacking the anchorage where we had been swimming just 90 minutes earlier. We certainly picked a good time to get out of Dodge. We sailed almost the entire night with no motor under a full moon. It’s the first time we’ve done this in a long time, and it was beautiful. On two separate occasions Holly and Jenna spotted unlit fishing platforms the size of log cabins. 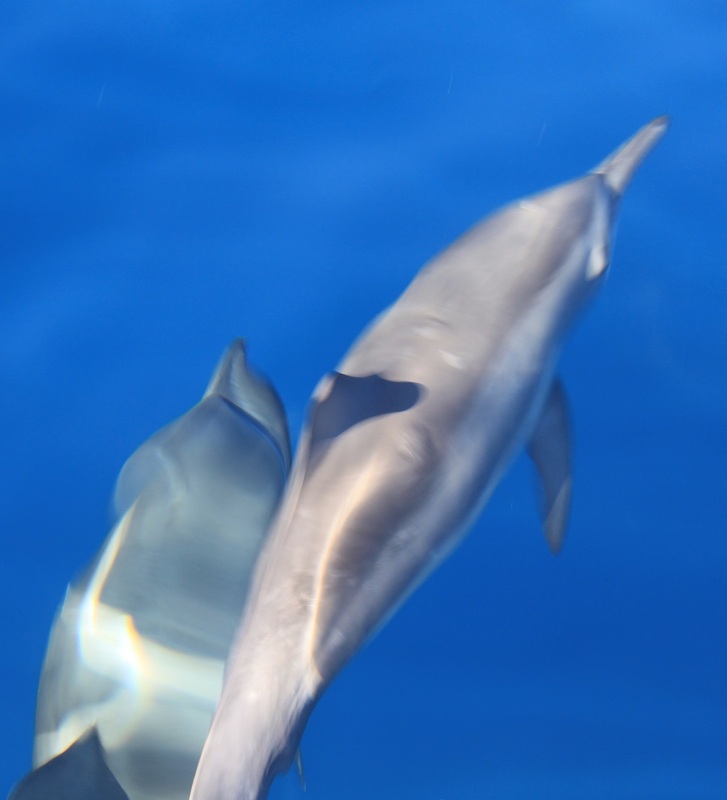 They were both anchored in 5000 feet of water and lay directly in Sophie’s path. The girls were able to skillfully avoid collision each time. Thank goodness for the moonlight. During my moonlight shift I unreefed the main and got Sophie up to 8 knots of speed a couple of times. I was smiling a lot. We seemed to have left the fishing area, so I watched the movie “Life Aquatic With Steve Zissou”, laughing at how much Bill Murray’s character reminded me of our friend Colin on the cat Segue. That was until the last 5 minutes of the movie, when it suddenly dawned on me that Steve Zissou was me, and that 11 and a half was my favorite age. Jenna has become quite good at Indonesian cooking. Yesterday’s lunch was a stir-fried tempeh in a peanut sauce that melted in your mouth. Our meat/meal ratio is plummeting the longer we stay in this country. 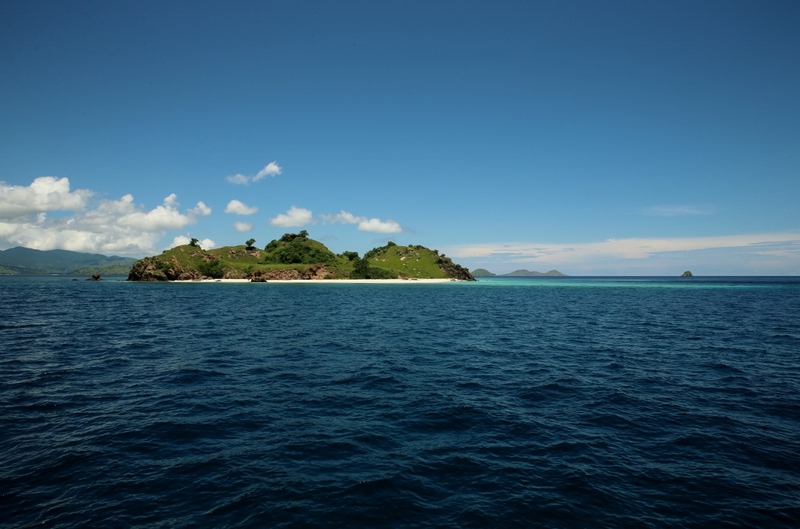 It’s 115 miles to the “17 Island National Reserve” on the north coast of Flores, and our current plan is to drop a hook there on Saturday morning and spend a day relaxing and snorkeling. 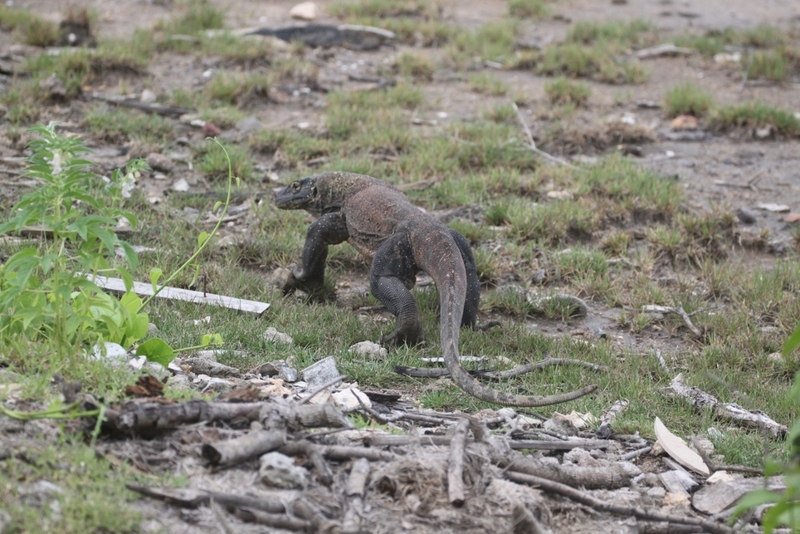 From there it’s just 70 miles along the coast to Labuan Bajo and another 15 miles to Komodo, home of the dragons. We are going to need a little more luck in the wind and tide department, but we would love to get a photo of Holly posing with some dragons to cap off her vacation with us. That would be awesome. We arrived in Hoga safe and sound two days ago. Our passage from Ambon wound up being a gentle and safe passage after our initial squall coming out of Ambon. 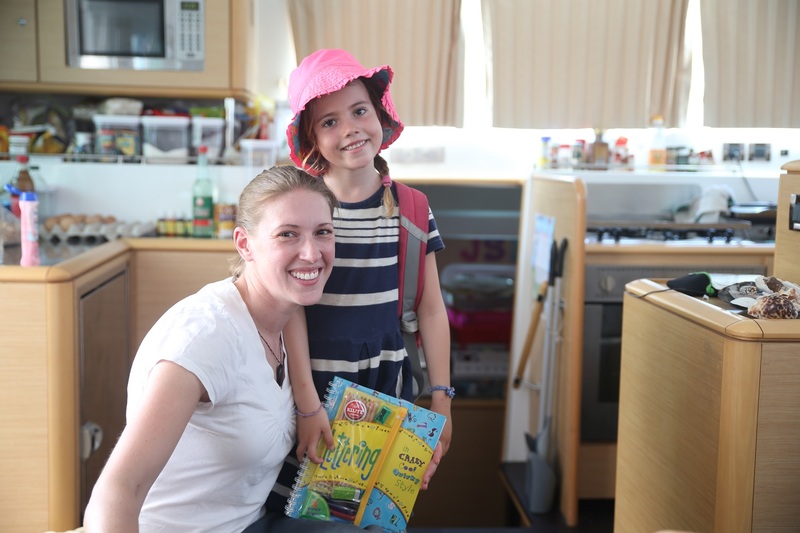 As I mentioned in our last post, Jenna’s cousin Holly has joined us for the passage from Ambon to Flores Island, and we are giving her the complete Sophie Adventure Cruise experience during our stopover in Hoga. 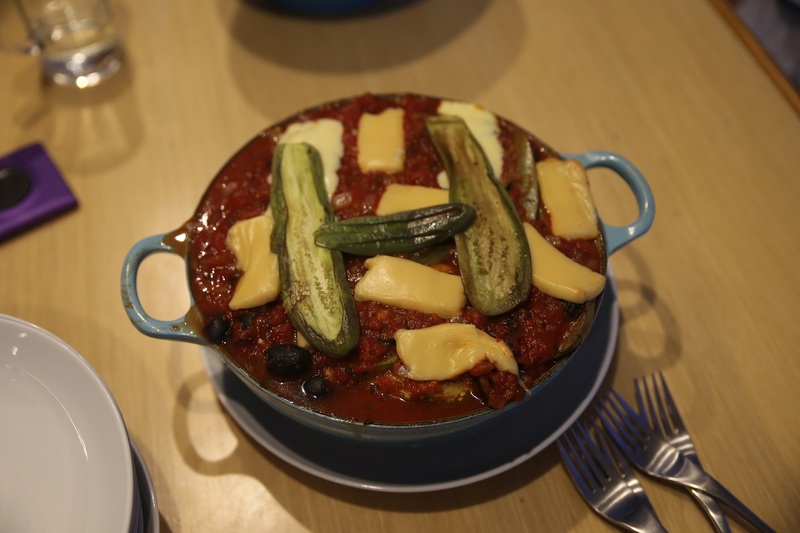 .. and capped of with an eggplant parmesan that Hazel and I prepared in Holly’s honor. 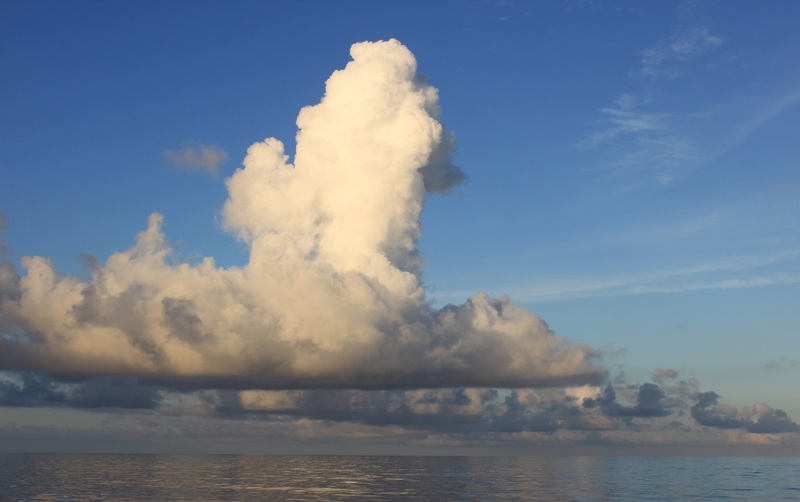 We are currently anchored in a passage between the islands of Hoga and Kepulauan. In reading the description of Hoga published in the book “101 Indonesian Anchorages,” we thought it would be a remote and wild nature reserve. It turns out that Hoga is indeed part of the the area’s Wakatobi Marine Reserve, but it has a village and a dive resort. Across the bay in Kepulauan are multiple large villages complete with stores and cell phone towers. We’ve spent two nights here and have fully recovered from our trip from Ambon. Activities here have included swimming, snorkeling, poker (Leo has learned a new game! ), and Settlers of Catan. The weather looks pretty settled over the next 4 days, and we will depart in a few hours for the 280 mile passage southeast to Flores and Komodo Islands. I’ve been worried about this passage over the last month because I’ve seen nothing but 20-30 knot westerly winds in the Flores Sea weather reports since Christmas. Our current forecast is for 10-12 knot westerlies today, dying down to under 5 knots over the weekend. 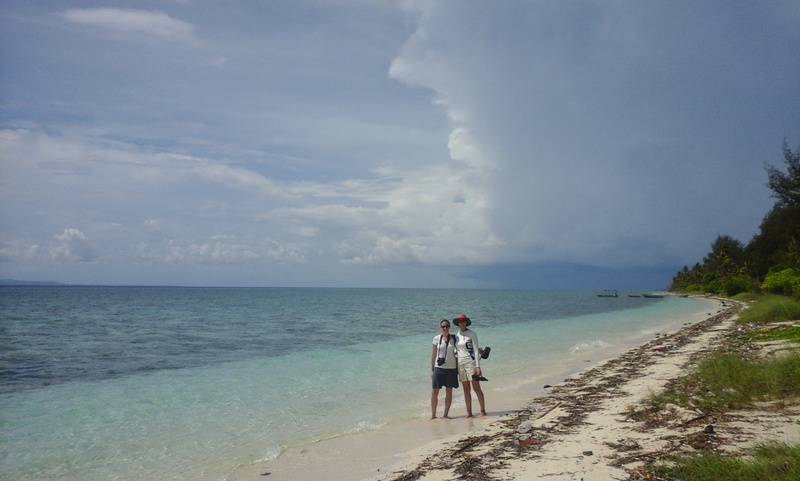 The local dive master says that in March, the wind transitions around from northwesterlies to the southeast monsoon. Based on the forecasts we are seeing, I believe that this transition period has begun. This is great news for us, because it means Sophie will soon begin sailing downwind as we continue on our journey to Bali, Kalimintan, and Singapore. That’s about it for now. Holly and Hazel are making crepes. I assume they will be delicious. I took a break from writing the blog over the last 10 days while I was in the US for my annual cancer screens. Great news all around. I am still cancer free, I had the opportunity to visit with good friends back in Seattle, Jenna’s cousin Holly flew back to Indonesia with me for a 12 day Sophie Adventure Cruise, and we decided to depart Ambon for Hoga Island in the Wakatobi Group the morning after Holly and I arrived back on Sophie. Oh yeah, and we also just learned that our beloved New England Patriots won the Super Bowl over the Seattle Seahawks in a nail biter of a game. Go PATS!, and thank you Seattle fans for all of the love and respect you showed me and my Patriots hat over the last week. So this initial Hoga leg was pretty important to us, important enough to make us decide to skip what turned out to be an awesome Super Bowl. The weather forecast called for 5-15 knot westerly winds from Sunday to Monday night, increasing to 10-20 knots Tuesday through Friday. We now know that in this part of Indonesia, the wind speed can easily be double what is forecasted, and Jenna and I were not thrilled at the idea of motorsailing into 30 knots of apparent wind for 300 miles just so that we could watch the Super Bowl. So it was an easy decision to take off on Sunday morning. It was tough, however, to say goodbye to our friends in Ambon. 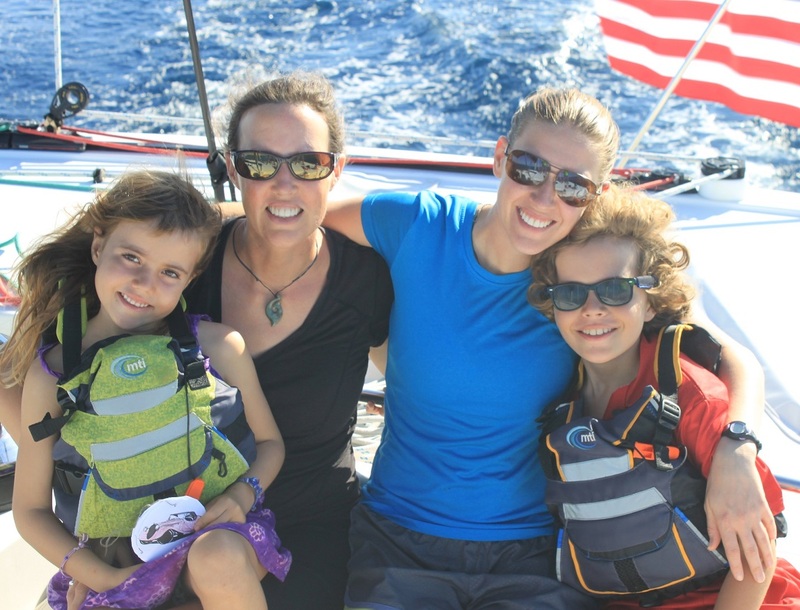 We have sailed with the Kee family and their boat Per Ardua for 3 months and 2500 miles, but their boat simply cannot motor to weather the way that Sophie can, so they will be heading Southeast to Banda and will hopefully rejoin us in Malaysia in June. Spending an extended amount of time with the Kee family was everything we had thought and dreamed cruising in the tropics would be like. We are all going to miss them very, very much. The same goes for John and Sue on the catamaran Ocelot, who will be heading to Banda with Per Ardua. Finally, while in Ambon we were able to connect with the Moores and the Connors, two lovely American expat families who shared with us incredible kindness and hospitality while helping us navigate around town. They were an especially big help to Jenna and the kids while I was back eating cheeseburgers in the US. We hope they can come and visit with us as we continue to head west. Sophie pulled anchor in Ambon at 10:00 AM local time on Sunday and enjoyed a fast motorsail for the first 20 miles out of Ambon Bay. Then the seas turned into a bit of a current-induced washing machine, and Holly became seasick. Then we were hit by one of our biggest squalls on the trip, a 15 mile-wide monster with sustained winds of 20-35 knots for 2 hours. It blew out by 8:00 PM, but it took the seas several hours longer to calm down. We’ve been motoring into a 10 knot headwind and 1 knot current for the last 15 hours. Both engines are running @2100 RPMs, no sails are up, and we have been averaging 6 knots since we left Amobon. We had a beautiful moon throughout the entire night and today has been bright and sunny with no rain. The current keeps the seas flat, and Sophie has a gentle motion. It’s great to be back where I belong. Our noontime position was 04.37.22 South 124.38.46 East. We covered 160 miles in 26 hours after leaving Ambon, and at this speed we will drop an anchor in the lagoon at Hoga on Tuesday morning. There is supposed to be excellent coral and beaches there, and we are all looking forward to getting back into the water. We are so lucky to be doing this, and we look forward to watching a DVD of the game in a couple of weeks.